Wacom is the venerable maker of pressure sensitive tablets and styli that have been the standard for digital artists for many years. My understanding is that the name is a combination of “wa”, from a Japanese word meaning harmony, and “com” from computer, meaning a device that puts one in harmony with a computer. They make several lines of products — their industry standard Intuos line of professional tablets, of which I have been a dedicated user in one form or another for over 15 years, their newer consumer oriented line of Bamboo tablets and touchpads and their high end Cintiq models. The latter incorporate computer displays in the tablet to allow for drawing directly on the screen. To these lines (and their smaller items like the Bamboo stylus for iPad) they are adding a new product called Inkling, a “digital sketch pen”. 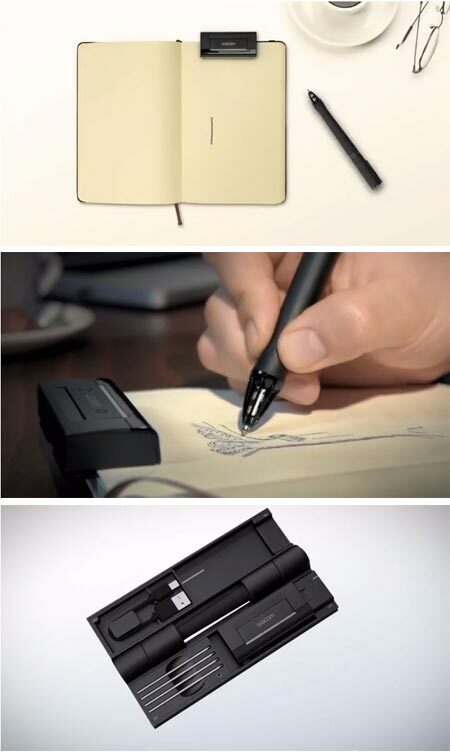 This is a ballpoint pen that incorporates some electronics and is accompanied by a small receiver box that clips onto the top of a sketchbook or drawing pad, allowing the user to draw with the familiar tool of ink on paper and simultaneously have that drawing stored electronically as a digital image for later download to a computer. There have been other “digital pens” that perform a similar function, but this is the first to offer pressure sensitivity, that quality in traditional digital drawing tablets that allows artists to vary the line weight (and often other characteristics of a stroke) with the amount of pressure applied to the pen. It also provides the ability for artists to add “layers” to the digital file, so that different parts of the drawing can be easily separated out on the computer. The digital image can be downloaded to a computer via USB and into the Wacom software provided. The included Sketch Manager software can transform the lines into vector paths or leave them as a bitmap. The files can then be exported into Adobe Photoshop, Illustrator and other common applications used by digital artists. This is obviously meant to accommodate quick sketches and rough drawings as opposed to the more finished work one would do directly on the computer with a tablet and graphics software, but it should be a welcome addition to the digital artist arsenal, and perhaps spread the appeal of digital drawing to those more comfortable with traditional drawing tools. One of the barriers traditional artists face when starting to use a pressure sensitive tablet is getting used to drawing while looking at the screen instead of one’s hand, which takes a little getting used to. This is certainly a less expensive way around that than the deluxe Cintiq models. The Inkling digital sketchpen retails for $199.00 U.S.D., and should be available in mid September. In addition to the Wacom product page, there is an introductory video on YouTube. Jason Scheier is a visual development artist and concept designer based in Pasadena, California. His clients include DreamWorks Animation SKG, NBC Universal, Anonymous Content, Honda Automotive, General Electric and DreamWorks Feature Films. The images on his website gallery have names, though they don’t include references to the projects for which they were designed. Scheier’s focus is on environments and landscapes, sometimes realistic, often wildly imaginative. His digital renderings feature carefully controlled color palettes and richly textured surfaces. His gallery even includes examples of digital plein air painting (images above, third from bottom) which have a nicely painterly look. Scheier is also in instructor at the Los Angeles Academy of Figurative Art where he is teaching an Imaginative Process Seminar on September 13. Impressionist painter Alfred Sisley (one of my favorites and in my opinion underrated) was more than any of the other French Impressionists devoted to the depiction of water, streams and in particular, the Seine River. Sisley painted several canvasses of the flooding of the Seine at Port Marly in 1872 and 1876. The three paintings here, showing the water covering the streets, were painted in 1876 in the same location. You can see a current photograph and map of the location here. Sisley has painted the flood almost as if it were the natural state of the town or the river, without drama, just his even straightforward take on the scene as a landscape painter. The first two paintings are in the Musée d’Orsay here and here. The bottom painting is in the Musées de Rouen. A Google image search will turn up a number of larger versions of the images, in an astonishing range of colors, as will a search on Flickr. I’ve tried to correct these a bit, based not on recently having viewed the originals (unfortunately) but on my exposure to other paintings by Sisley, and my experience with incorrect color shifting of images posted on the web, even by the museums that house the originals in many cases. My notion for this post came from Katherine Tyrrell’s post about Sisley’s other paintings of the flooded Seine. Classic illustration enthusiasts were dismayed a while back to learn of the apparent demise of Bud Plant Illustrated books, a long-time collaboration between Jim Vadeboncoeur Jr. and Bud Plant that was a key source of out of print books about great classic illustrators and comics artists. The good news turned out to be that Vadeboncoeur and Plant have simply taken their individual contributions into their own separate spaces, where they have been able to refocus their efforts. Plant is selling a more focused selection of books at the new Bud’s Art Books site and Vadeboncoeur has retooled the venerable bpib.com web address as JVJ Publishing, featuring his absolutely beautiful magazines ImageS and Black & White ImageS, which I have raved about previously (and here). In addition, Vadeboncoeur is continuing to maintain his terrific resource of classic illustrator biographies (image at left), which is one of the first places I look when researching a classic illustrator. The biographies are short, succinct and information and illustration dense. Vadeboncoeur has been an important voice in the promotion of great classic illustration from the late 19th and early 20th centuries, from artists both well known and undeservedly obscure. One of the joys of ImageS magazine is the mixture of the familiar and unfamiliar; even devoted classic illustration aficionados will frequently be introduced to long lost gems by unfamiliar names. Vadeboncoeur’s enthusiasm for great classic illustration and his obsessive attention to reproduction quality and image details make every issue of ImageS a treat. Part of the good news about his recent makeover of the JVJ Publishing site is the inclusion of much larger preview images of the more recent issues, giving you a better taste of the issue’s contents (click on the covers for the pop-up previews). I have to stress, though, that they still don’t provide a realistic picture of the superb image quality of the issues themselves. The first five issues of ImageS are sold out; issues 6 through 12 are still available. The first issue of ImageS Black & White is sold out; issues 2 through 5 are available. Those of us on the Eastern Seaboard of the U.S. are either experiencing or bracing for the impact of Hurricane Irene, the outer bands of which are starting to drop heavy rain and whip up heavier winds here in Philadelphia as I write. It put me in mind of the storm paintings of Russian (Crimean) painter Ivan Aivazovsky whose prolific oeuvre of marine paintings included many of roiling tempests and shipwrecks. Many of these are from the WikiPaintings site, which usually has fairly large versions of the images. For more, see my previous post on Ivan Aivazovsky, which includes several other image resources.